Western blot analysis of extracts from various cell lines using Gasdermin D (L60) Antibody (upper) or β-Actin (D6A8) Rabbit mAb (lower). Western blot analysis of extracts from THP-1 cells, untreated (-) or treated (+) with TPA (12-O-Tetradecanolphorbol-13-Acetate) #4174 (50 ng/ml, 24 hr) followed by Lipopolysaccharides (LPS) #14011 (5 μg/ml, 6 hr), using Gasdermin D (L60) Antibody (upper) or GAPDH (D16H11) XP® Rabbit mAb #5174 (lower). 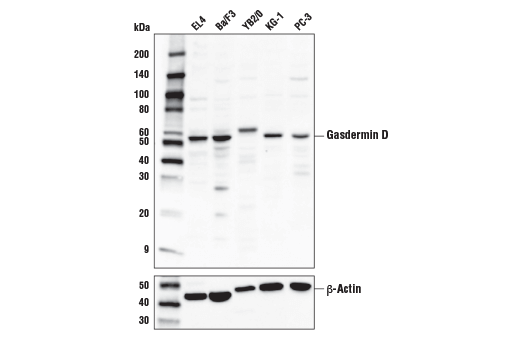 Gasdermin D (L60) Antibody recognizes endogenous levels of total Gasdermin D protein. 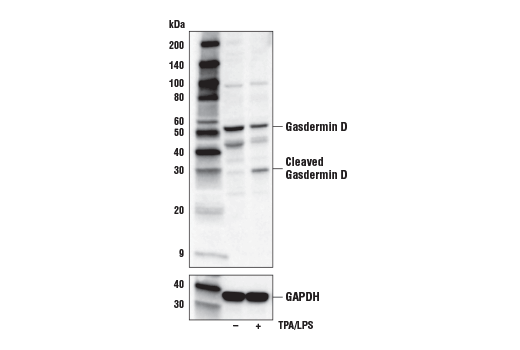 This antibody detects the N-terminal fragment of Gasdermin D upon proteolytic cleavage. Polyclonal antibodies are produced by immunizing animals with a synthetic peptide corresponding to residues surrounding Leu60 of mouse Gasdermin D protein. Antibodies are purified by protein A and peptide affinity chromatography. Gasdermin D (GSDMD), a member of the gasdermin family that includes GSDMA, GSDMB, and GSMDC, has been reported to have a critical role as a downstream effector of pyroptosis (1,2). Pyroptosis is a lytic type of cell death triggered by inflammasomes, multiprotein complexes assembled in response to pathogen-associated molecular patterns (PAMPs) or danger-associated molecular patterns (DAMPs) that result in the activation of caspase-1 and subsequent cleavage of pro-inflammatory cytokines IL-1β and IL-18 (3). Gasdermin D was identified by two independent groups as a substrate of inflammatory caspases, caspase-1 and caspase-11/4/5, producing two fragments: GSDMD-N and GSDMD-C. Cleavage results in release of an intramolecular inhibitory interaction between the N- and C-terminal domains, allowing the N-terminal fragment GSMDM-N to initiate pyroptosis through the formation of pores on the plasma membrane (4-7).